Swooper flag shown with tire base. Now 140 Swooper messages available for many different industries! Just added 20 new slogans on 7/18/18. One of the most popular flag kit produced in the past 10 years. 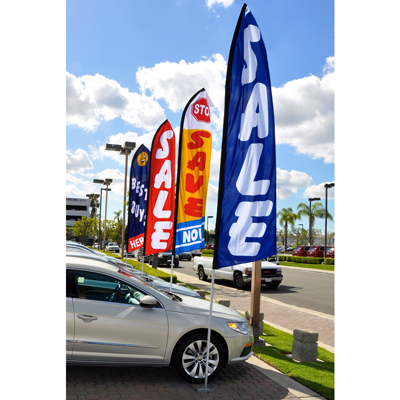 These giant Swooper flag kits will be sure to draw attention to your business or promotion. 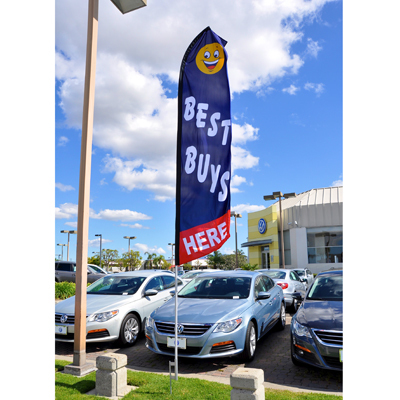 Giant 15' overall height these flags are made to stand out and let potential customers know exactly what you are selling. Each kit consists of one 11.5' tall x 2.5' wide deluxe knitted polyester swooper flag with double sewn hemmed edges and a hemmed black pole sleeve. 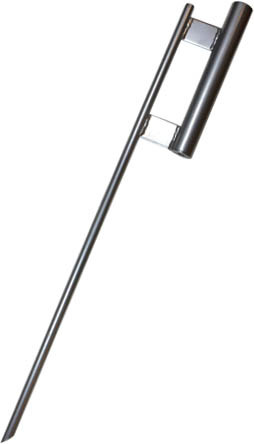 A 15 foot, 4 section pole kit and a ground spike, tire base or vertical pole bracket. Your choice! Pole comes in 4 section that swedge together for cheaper shipping. (other poles are 3 sections and more expensive to ship). Your choice of H.D. 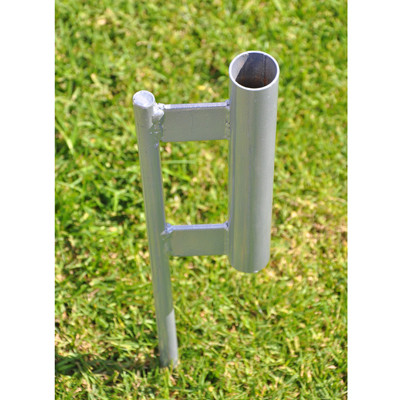 ground spike for display in just about any area where the ground is soft enough. 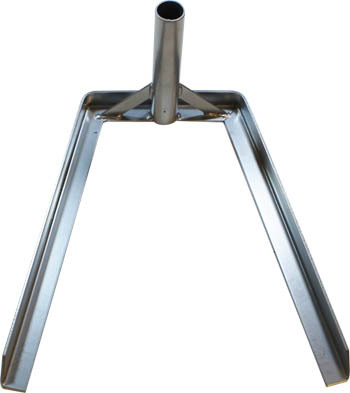 Or a tire base for display under the tire of any vehicle or a vertical pole bracket to mount to a building, fence, etc. Note: Beware of the cheaper priced Swooper flags and hardware kits. These flags have the black pole sleeve with thicker/heavier polyester fabric while the hardware has thicker wall poles and h.d. bases! 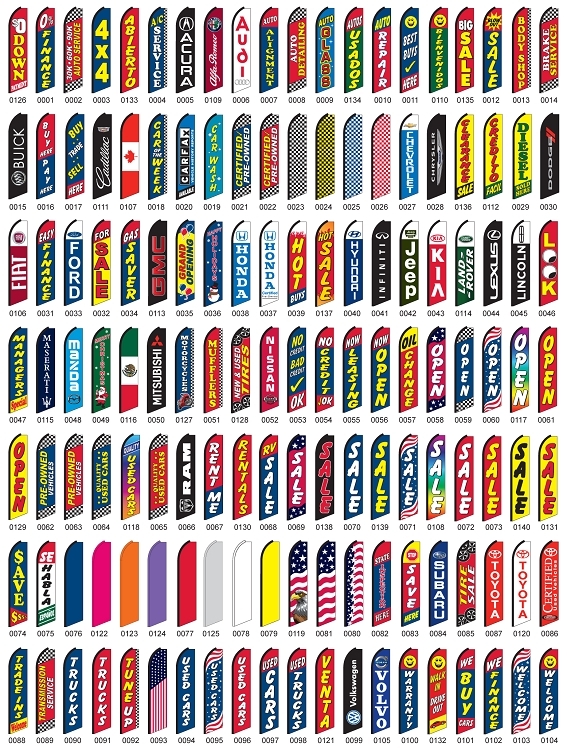 Flags, poles and bases available for purchase separately. Durable 4-piece pole set is made of anodized aluminum tubing with extra thick walls. 4 Pole Sections fit together with unique swedged design. Assembled pole set stands 15 feet tall. Our deluxe knitted polyester flags (Swoopers) feature double sewn hemmed edges and a hemmed sleeve. Flag measures 11.5 ft x 2.5 ft.
Includes convenient rope tie on the bottom to prevent the flag from wrapping around the pole. Extra strong, reinforced black oxford sleeve hides dirt and is designed to withstand high winds over time. Curved sleeve with free flying end allows flag to "flutter" in the wind. NOTE: The franchise dealer logo flags are available for authorized franchise dealer only!!! You must be a Chevrolet, Ford, Chrysler etc. dealer to purchase those logo flags! These flags have held up well and they have not discolored. Well worth the money.